Chandrababu Naidu’s Deft Move To Hit BJP Where It Get Hurts And It’s Dangerous! After the bifurcation of Andhra Pradesh in 2014, Andhra Pradesh Chief Minister N Chandrababu Naidu has taken two major political decisions which called for courage and conviction of a very high order. His most recent decision was one which helped an unusual friendship bloom between him and Congress chief Rahul Gandhi. This marked a fundamental change in the TDP’s character. Joining hands with the Congress could not have been easy for Naidu. For decades, since the birth of the Telugu Desam party (TDP) in 1982, the Congress was the Telugu Desam Party’s principal rival. N T Rama Rao started the party on the foundations of what he called anti-Congressism. Now the arch-rivals are bosom friends. They appear as though they have been friends for ages. The other decision in the recent past which came as a shocker to many was bidding adieu to the BJP and pledging to take Modi’s guts for the garters for denying Special Category Status to Andhra Pradesh and for not fulfilling assurances made in the AP State Reorganisation Act. He had taken the decision of changing the horses in the midstream and took up Special Category Status slogan despite running the risk of being seen as one who had not given up his habit of dumping his friends. Then there was a criticism that he was aping Jagan Mohan Reddy who was miles ahead of him in demanding Special Category Status. Naidu’s slogan did not get much traction since it came very late and that too after his repeated assertions that package was a better bet than Special Category Status. According to sources, he dumped the BJP for the same reason he elected to support it in 2014 – only to shore up his electoral prospects. He reportedly decided to break the alliance with the NDA after a survey he had commissioned had revealed that Modi’s graph was tumbling downhill relentlessly and inexorably. ALSO READ: Why The AP Govt Spent 30 Crore On Chandrababu Naidu's 'Special Category' Fasting Event? Now once again, after building some credibility for himself that he was really going after Modi’s jugular with his octane attack on the Prime Minister at his several dharma porata deekshas, he joined forces with the Congress. This decision was jarring for some old timers in Telugu Desam Party – his deputy KE Krishna Murthy and Roads and Buildings Minister Ch Ayyanna Patrudu – who had openly declared their opposition to the idea when it was still in the stage of infancy. They have now pursed their lips as though they are bound by the code of Omerta. Now the die has been cast. Naidu has made a political investment in the new Congress-TDP venture. For those who wondered why Naidu took the risk of hanging on to the coat tails of the Congress, the answer is not difficult to find. In these days of Machiavellian politics, the end always justifies the means. The set of principles that govern political dynamics is different from the one that is meant for society at large. As the principles are different, there is no point in calling, say changing a partner – is unethical since what is unethical in society is ethical in politics because it is a means to the end. 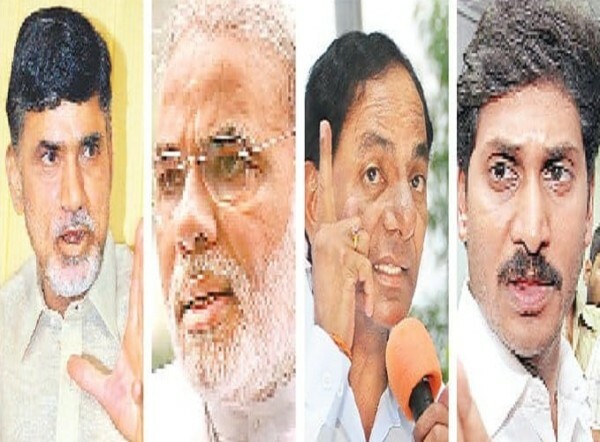 As winning AP is very crucial for Naidu with Jagan Mohan Reddy baying for his blood on the streets, whatever political decisions that Nadiu had taken so far are meant more to help the TDP win the elections in AP rather than installing a non-BJP government at the Centre or help Congress come to power in Telangana. This was the reason why Naidu had said he had no national ambition because he knows he may not have a chance as there are several non-BJP leaders outside AP who wants to occupy the throne like Mamata Banerjee, Mayawati and Sharad Pawar. ALSO READ: Why KCR Didn't Induct KTR And Harish Rao Into Telangana Cabinet Expansion? Naidu with just 25 Lok Sabha seats in his hands, assuming that he will win all of them, he would not be able to hold a candle to others whose States have double the number of Lok Sabha seats or even more. Naidu, however, wants to support the Congress in Telangana and chip in at Delhi to cobble up a coalition against the BJP, because he wants to defeat the Telangana Rashtra Samithi (TRS) and its chief Chandrashekar Rao in Telangana by lending support to the Congress. This is vital to him since if the TRS comes back to power in Telangana, he would have a tough time in AP fighting elections six months from now as Chandrashekar Rao, who wears his hatred against Naidu on his sleeve, would lend whatever support Jagan Mohan Reddy might need. Apart from this, If Naidu helps the Congress win in Telangana, his stock in Andhra Pradesh will go up, and he could claim that he had his first victory against the BJP which, according to him, is sworn enemy to AP. He would interpret defeat of Rao as the defeat of the BJP since Chandrashekar Rao and the saffron party are suspected to have a tacit electoral understanding. Another benefit that Naidu would get by, helping the Congress win the election in Telangana is that it would demoralise Jagan Mohan Reddy who is the main challenger for power in AP and Pawan Kalyan who might emerge as a kingmaker. Apart from the TDP acquiring a new lease of life in Telangana, the Congress, as a gesture of goodwill, would go all out to help him to the extent it can in Andhra Pradesh. It is estimated that the Congress still has about five to six per cent of votes which will add to Telugu Desam kitty as he would not be having the support of Pawan Kalyan and the BJP this time. He won the elections in 2014 with a difference of just two percent and if the Congress is by his side, the loss may be compensated, and he may return to power. At present, surveys hold out little hope for the BJP at the national level. In Rajasthan, it is said that the Congress has better prospects and in Madhya Pradesh and Chhattisgarh, it might benefit because of the refusal of Mayawati to have a pact with Congress which proves the point that in Lok Sabha elections, the Congress may have an edge since Mayawati has already said that she may support the Congress in parliamentary elections. The steady defeats that the BJP had logged in at all the by elections held for Lok Sabha seats makes a depressing narrative for the saffron party – It won only five of the 27 by elections held so far in the country since 2014 across the nation. It could not wrest even one seat held by the Opposition. As BJP is a little subdued now, it is also perceived that Naidu is making every effort to hit the saffron party where it hurts most and thus weaken its morale. Having carried out a prolonged attack on the BJP in the State to polarise people on his side, he wants to help the anti-BJP forces at the national level to wage a no-holds-barred battle against the BJP.